Galway will be the most trended city in the country this weekend when The g Hotel in Galway is the location for the first birthday celebration of the hugely successful Into the West Blogger network. The past 12 months have been a veritable whirlwind for the group created to support and connect the growing pool of blogging talent in the west of Ireland. “Our mission is to grow a network of quality bloggers within the West of Ireland and extend an invitation to the rest of the country and beyond to join us in creating a group of passionate and creative individuals that can learn from each other,” the pair explained. Sinéad and Saibh were overwhelmed by the response with all tickets selling out in a matter of hours. Blogging has not only grown in popularity but grown in importance as a marketing tool, many companies have recognised the unique influence and relationship bloggers have with their readers. Bloggers can reach target markets in a way traditional marketing never could, hence the growth in collaborations. Social media is at the core of this with twitter and Facebook being among the most significant influences on customer behaviour. Sunday May 10 sees the fifth and to date, biggest event organised by Sinéad and Saibh. 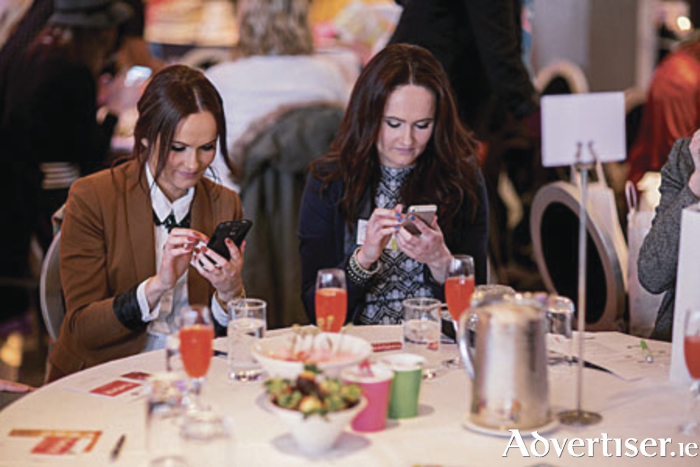 The g Hotel will welcome 125 bloggers from all over Ireland and a number of international attendees. Guest will be able to peruse a number of exhibitions from companies such as The Body Shop Ireland, Debenhams, Boots, IsaDora, Amber, Envy Organica Hair, Cotton Face Vintage and Greenes Shoes. The agenda for the day is both educational and fun with an emphasis on networking and connecting people. The speakers are successful Irish blogger and ISPCC Ambassador Sinead Burke, Deirdre Dunne from Castle Print Galway, impressionist Aiden Tierney, motivational speaker Wayne Denner and Karen Brown co-founder of Karora Cosmetics. As well as events like Sunday the Into the West Blogger Network (ITWBN ) deliver workshops under the name #itwbnBlogSchool. The next workshop will take place on May 18 in the Connacht Hotel. This is a Wordpress for Beginners workshop, specifically targeted to business and personal bloggers making their first foray into the world of blogging. Attendees will be taught how to set up and maintain your blog in a fun and positive environment. Sunday is a celebration in every way as it is the network’s first birthday. One year of fantastic events and bringing people together. The network itself is proof of the reality of the business of blogging, with founders Sinéad and Saibh leading the way. The pair have drawn on their personal and professional experiences to develop the project. Creative director Saibh a widely published fashion photographer and graphic designer manages’ the social media portfolio of the Into The West Blogger Network. Sinéad with a background in finance and sales is responsible for business development and the financial management of the business. For more information e-mail [email protected] and follow ITWBN on Twitter, Facebook, and Instagram. Page generated in 0.1849 seconds.